A bit closer: the white buildings mark the approximate location of the Schiedam and Rotterdam city gates shown by Vermeer. They were demolished in the 1830s. (One of the city's gates--the East Gate-- remains and appears here later.) The waters flow from here in almost every direction. There's a stream branching to the left (the Buitenwatersloot), another on the far right (the Rijn-Schiekanall), and a third passes through the double-arched bridge and penetrates into the old city, where it quickly divides into several canals, including the Oude Delft. Behind the camera, the waters flow through the Schie Canal to Rotterdam. 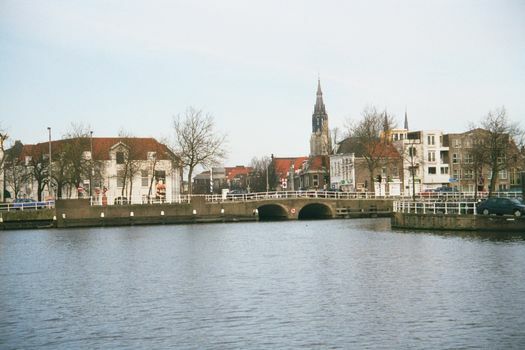 The VOC buildings lay along the Oude Delft canal, perhaps a hundred meters beyond the bridge.